Depending on the model, we also offer filler feeding solutions based on screws, vacuum or compressed air. Fully integrated solutions are suited for automated operation. Vacuum feeding is yet another development of press mixer technology and serves to feed powdery components into the mixing space under vacuum. This type of feeding is by now available for all vacuum mixers (apart from the continuous twin screw mixer). 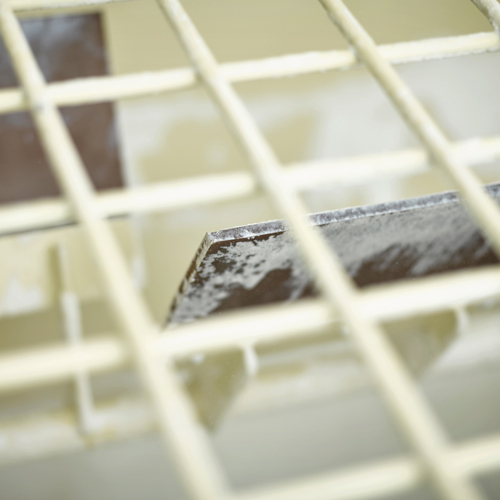 When handling powders with a low bulk density, the benefits for the operator are particularly noticeable – even more so if large amounts of powder have to added. The vacuum feeding system makes it possible to add the solid matter to the liquid basis under vacuum, i.e. the dispersion takes place under exclusion of air and other gases, leading to a better dispersion result while avoiding the creation of gas cavities, which would normally be generated by the ultrafine distribution of the carrier gas. In most cases, no degassing is necessary after the mixing process unless gases which were formed during the process as a result of chemical reactions have to be withdrawn. The traditional way of inducing powder into the mixer always required a certain amount of carrier gas which had to be injected as well (usually air or nitrogen). This means that after every intake procedure the admixed air or gas had to be withdrawn again. Especially powders of a low bulk density had to be fed into the mixer in several steps. Particularly in such cases, vacuum feeding is a huge timesaver. Most powdery raw materials are much more effectively dispersed under vacuum. A dispersion “without air cushions” leads to a far better dispersion behaviour and a more intense shearing. Solid matter is fed into the mixer directly or via weighing containers installed preceding the mixer. Different components can be brought together via separate scales for batch-wise or continuous feeding. We offer a range of dosing devices for the feeding of fluids to mixers. Depending on the viscosity, you can choose between tank scales and flow meters.